I made a meatloaf this evening, the first time ever. It's funny how you have something on your mind for a while and then you finally get round to doing it. My moment of truth came in Carrouf when I decided to buy some pork farci to go with the mince meat I had at home. I thought you had to use pork and beef in meatloaf. Actually, it turns out you can put in practically whatever you like. 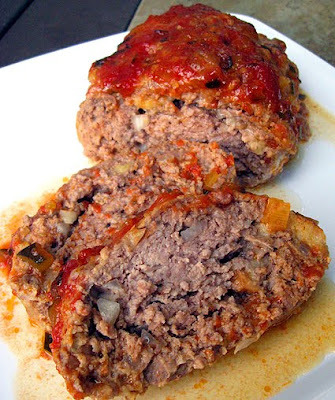 The Gastronomy Economy book uses ground lamb and aubergine in a sort of moussaka-like meatloaf. I had a look at two receipes on the internet here and here and mixed and matched and made it up as I went along. I had some sad bits of veggie lurking in the veggie draw so chopped them up and chucked them in - some green pepper and red piment (no idea how hot it is...), onions, parsley and loads of garlic. I used up all the meat which made tons of mixture so I made two meatloafs. I pressed the mixture into a loaf tin and then turned it out onto my roasting tin rack. Twice. If you leave it in the tin you have to pour off the liquid and fat half way through and that sounds like a fag to do. I rustled up the glaze, with less sugar than suggested, and it's now doing it's stuff in the oven. At the weekend I made the EG pumpkin risotto and that was tip top yummy. I didn't follow the recipe precisely because I was cooking for a non-cheese eater, so left out the gorgonzola, and added fried bacon bits instead. I managed to do most of the preparation in the same pan - toasting the walnuts, frying the bacon and then frying the pumpkin, having given the pan a quick rinse. It wasn't exactly an easily-prepared dish, but it was very tasty and I don't really mind spending a bit of time in the kitchen to get some extra taste. If you're interested in reading how one of the particpants in the EG challenge coped, try this blog which is the one where the pumpkin risotto gets an airing. I've just been down to look at my meatloaf and I must say it looks very appetising and smells terrific. The glaze has done a great job. Let's hope it gets Boy Approval! Later... the meatloaf was excellent. My youngest even told me I should make it more often, which I will because it was dead easy. The glaze was a great addition because it caramelised and added an extra taste dimension to the top.